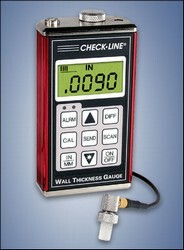 TI-007 High Resolution Ultrasonic Wall Thickness Gauge Reliability Direct, Inc. Your Direct Source for Reliability, Maintenance, Test & Measurement! 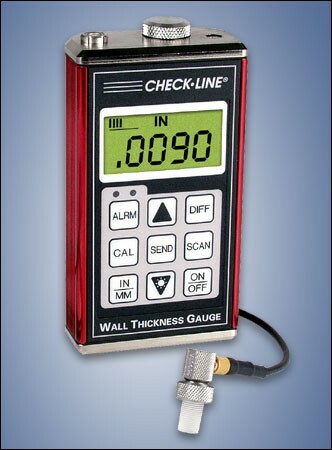 The TI-007 is a precision ultrasonic wall thickness gauge specifically suited to make extremely precise and high-resolution measurements on thin-walled metal and plastics. It is packaged in a sturdy extruded aluminum housing which is sealed for excellent environmental protection assuring trouble-free use even in the toughest field and production environments. Single element with delay tip. 10 to 22 MHz frequency range. 4 ft. (1.2 m) waterproof cable with non-polarized, quick-disconnect LEMO connectors.